Find Better Ideas, Faster ® with a custom sunscreen trend report, our PRO Dashboard and 80+ categories of premium trend reports. 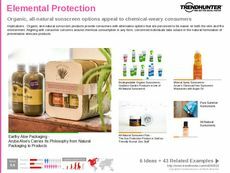 The Sunscreen Trend Report filters through the many products from skincare brands that are made to protect the face and body from harmful UVA and UVB rays. Taking a look at technologically advanced sunscreen to DIY all-natural sunblock, the options range quite widely and this report helps synthesize the patterns across the most popular sun protection lotions. It also includes a look at skincare and health apps that are designed with the purpose of warning consumers if they are at risk of getting burnt. This report is applicable to skincare manufacturers and professionals involved with research and development in the beauty or cosmetic industries. It is also an invaluable tool for personal health retail suppliers as well as pharmacists to better inform themselves and others about the many options and resources for sun protection. This report combines information and patterns in skincare products that protect from harmful UV rays to give cosmetic brands and retailers an in-depth understanding of the best ingredients, forms and packaging of sunscreen lotions.